The Dow Jones Industrial Average is up following some better-than-expected U.S. economic releases. As of 1:25 p.m. EDT the Dow is up 101 points, or 0.69%, to 14,814. The S&P 500 is up 0.74% to 1,594. The two to take note of are consumer spending and pending home sales. The National Association of Realtors' pending-home-sales index was up 1.5% in March to 105.7 after dropping 1% in February. 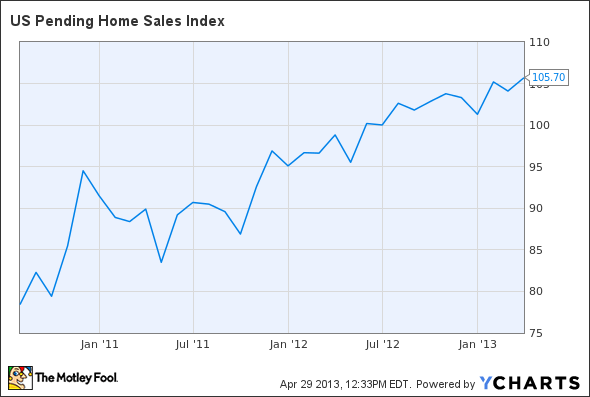 US Pending Home Sales Index data by YCharts. A sale is listed as pending when the contract has been signed but the transaction has not yet closed. Thus pending home sales are an indicator of future sales, so a rise bodes well for the housing market. The index is currently 7% above the year-ago level. Meanwhile, although growth in consumer spending slowed in March, a slowing U.S. economy was largely expected as consumers cope with higher payroll taxes and gasoline prices than they did last year. As such, many investors feared the worst in the consumer-spending report, especially after last week's disappointing GDP report. The market is up because March's small gain is double analyst expectations of a 0.1% gain. Consumer spending in the U.S. is important, as it makes up nearly 70% of the U.S. economy. Today's Dow leaders are all from the technology sector. Near the top is Hewlett-Packard , up 2%. HP hit a high of $25.40 last month as investors grew confident in HP's turnaround. The stock got ahead of itself, however, and has since come back down after the worst drop in PC sales ever was reported by market research firm IDC. The massive wave of mobile computing has done much to unseat the major players in the PC market, including venerable technology names like Hewlett-Packard. However, HP is rapidly shifting its strategy under the new leadership of CEO Meg Whitman. But does this make HP one of the least-appreciated turnaround stories on the market, or is this a minor detour on its road to irrelevance? The Motley Fool's technology analyst details exactly what investors need to know about HP in our new premium research report. Just click here now to get your copy today. IBM is up 2.3%. As the Dow component with the highest stock price, IBM has the most to do with the Dow's gains today. Two weeks ago the stock was crushed after IBM missed earnings and revenue expectations. The stock has slowly been regaining its lost value as investors take advantage of the drop to purchase shares. Microsoft rounds out the top three Dow stocks, up 2.2%. Last week Microsoft sent out invites for a media event on May 21 at which the company will unveil its new Xbox. Microsoft has been struggling in the press, as many blame the company's Windows 8 for terrible PC sales. While PC sales are declining, Microsoft still generates huge amounts of cash, and it reported solid results last week. The article 3 Stocks Leading the Dow Higher originally appeared on Fool.com. Dan Dzombak can be found on Twitter @DanDzombak or on his Facebook page, DanDzombak. He has no position in any stocks mentioned. The Motley Fool owns shares of International Business Machines. and Microsoft. Try any of our Foolish newsletter services free for 30 days. We Fools may not all hold the same opinions, but we all believe that considering a diverse range of insights makes us better investors. The Motley Fool has a disclosure policy.